Regular wellness exams are one of the most important things you can do to keep your pet healthy. We perform nose to tail comprehensive physical examinations on every patient, from newborn puppies to elderly seniors in order to monitor their lifelong health. The American Animal Hospital Association (AAHA) recommends annual wellness exams at a minimum and as your pet ages, they suggest an increase in frequency of visits. Pets age much faster than humans and health problems can emerge and progress very quickly. Prevention and early detection are the key to a longer, healthier life. 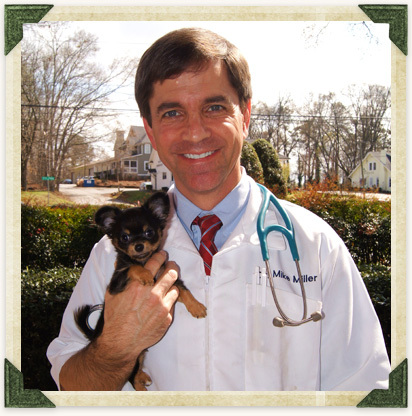 During a physical exam, your doctor will evaluate all your pet’s physical parameters such as age, size, and breed. We will discuss your pet's history, lifestyle and environment, as well as changes in temperament and appearance to identify risk factors for diseases or health concerns. We perform annual blood screening that allows us to detect the early stages of kidney and liver disease, diabetes, low protein values, and electrolyte imbalances. Many problems show no outward symptoms until damage is already done in the body. Blood testing on younger patients allows us to establish a baseline for your pet as they age, and we can more quickly find and treat underlying problems. We believe strongly in preventative care and have developed wellness protocols for every stage of your pet's life. Skin: Our doctors check the overall health of the skin, as well as look for any lesions, growths, skin infections, evidence of parasites such as fleas, mites, or ticks, or any worries that should be addressed. We will also evaluate your pet's hair coat health and thickness, as this can be an indicator of overall health. Ears: We will take a look from the outside ear flap and into the ear canal to check for the beginnings of infection such as swelling, redness, or discharge, as well as common parasites such as ear mites. Eyes: In checking the eyes, we will look for any age-related changes that indicate the beginnings of vision loss, as well as any sign of eye infection or growths around the eyelids. Teeth: Checking the teeth and gums will help determine whether your pet requires a dental cleaning and can give us a good indication of overall oral health. We look for cracked, broken, or worn teeth, pockets of abscess or infection, masses, redness and inflammation of the gums. A large percentage of the tooth is below the gumline, so dental cleaning and x-rays can find problems that are not visible to the eyes. Abdomen: Palpation of the abdomen can indicate if the organs feel the correct size and location and help evaluate the kidneys, liver, pancreas, and bladder health. Heart/Lungs: Doctors check for heart murmurs, pulse quality, and arrhythmia. The lungs and breathing sounds are also checked. This provides a great comparison to last year's exam where any changes can be noted, treated, and monitored over time. Lumps/Growths: Bumps and growths on the body can range from nothing to worry about to serious medical concerns. Early detection is the key to successful cancer treatment. Cancer can show up in any part of the body, and comprehensive physicals are a key component to finding these abnormalities. We can even perform needle biopsies during an exam for more rapid information on the cells within a lump found on the body. Joints: Pets can hide pain or discomfort caused by muscle strain, arthritis, or limb weakness. Joints are felt by the doctor to ensure they are properly rotating and extending during movement and we will evaluate the way your pet sits, stands, and walks. Nutrition: Just like in humans, the fuel put into your pet's body can make a huge impact on overall health and longevity. Diet can help maintain a healthy weight and active lifestyle, and can also help manage problems such as diabetes, kidney or liver disease, allergies, joint issues, urinary problems, and more. Behavior: Obtaining a pet's history is very important. Noting changes in behavior and temperament can indicate a health issue. Changes in the way a pet acts can be due to age-related problems, pain or weakness in a part of the body, fear or anxiety increases, and more. Environmental/Lifestyle: We will discuss your pet's lifestyle, activity level, and routine. We can also discuss individual risks and any environmental health indications for your pet.